As any Death Watcher knows Fidel Castro has for some time been the most important figure in the death watching community. This isn’t necessarily because he is the most important person in the world who is hanging on to life by a string, but rather because the actual act of his death will mean so much to so many people, and will trigger such a bevy of reflection and analysis . 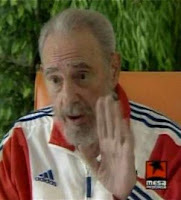 Thus, all glory to the Death Watcher who predicts or is the first to report Castro's real-life no-foolin' death. By resigning his post as Cuban President yesterday, Castro has done irrevocable damage to what would have been the momentous and stark occasion of his final day. Sure when Castro dies there will still be dancing on the streets of Miami, and the Bay of Pigs experts will finally get to make their color TV debuts. But it just won't be the same now that Castro has dulled his exit from the scene he has so long been a defiant part of by making his departure incremental. Of course this Death Watcher will continue to track the breathing status of Cuba's ex-president. But now with no more intensity than I put into my study of figures such as Amy Winehouse and Britney Spears.